Westmead manager, Anna Rowe Zouki and head chef Suman Karkai are making healthy choices at Westmead hospital. New healthy food and drink choices are being made available to staff and visitors in all food retail outlets across the Western Sydney Local Health District (WSLHD). Services coordinator Belinda Ford said hospitals play an essential leadership role in helping the health workforce. “It is our responsibility to support patients, friends, family and staff to easily make healthy food and drink choices while visiting our services,” she said. All food retailers across our health facilities are working towards offering healthier food choices and making them readily available for visitors and staff. The team at Zouki, led by Westmead Zouki manager Anna Rowe and head chef Suman Karki, are one of many retailers in our health facilities supporting the move towards healthy food and drink options in our hospitals. “We are not a typical retail outlet, we are in a hospital and we have a responsibility to embrace this change and promote healthier lifestyles,” Ms Rowe said. “It’s healthier living and its healthy living at the hospital. Zouki are well placed to lead these changes following the success as one of the first retailers in New South Wales to remove sugar sweetened drinks from their Westmead outlets as a step towards offering healthier choices. “We see this as an opportunity to teach how a healthier choice is not to be seen as boring or tasteless, it’s challenging consumer’s views on food and on why healthier eating is a better choice for all and why these changes are necessary,” Ms Rowe said. Zouki head chef Suman Karkai preparing healthy meals. 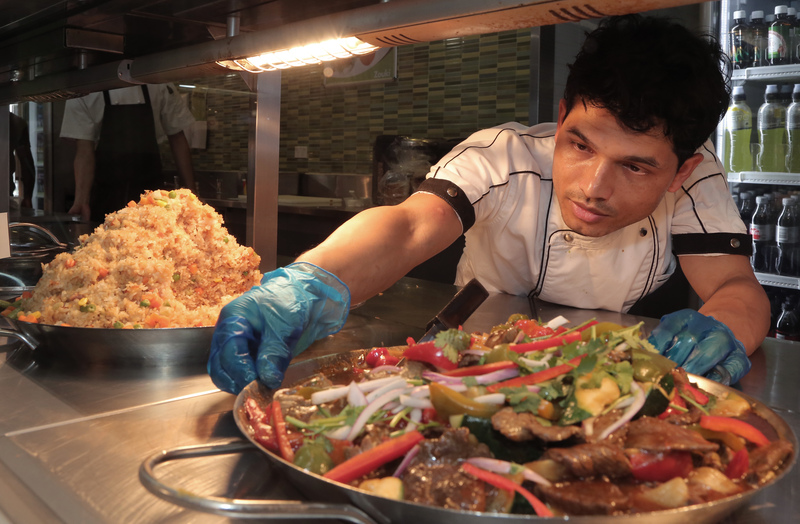 Zouki head chef Suman Karki works with his team to create tasty healthy dishes. The in store menu changes daily and offers a wide selection of healthy choices such as stir fry beef and vegetables and beetroot, pumpkin, feta and rocket salad. Healthy foods are now placed in prominent locations to tempt us into buying them.